The problem of gnats is not an uncommon one. When you leave fruits and garbage cans uncovered, or have some fruits that have started to ripen and rot, these fruit lovers come like uninvited guests and hover around the home. Gnats are also commonly known as fruit flies or vinegar flies and these annoying creatures require moist and warm conditions of an organic product like a rotting fruit to breed and lay their eggs. 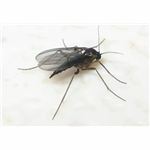 Getting rid of gnats can be difficult and time consuming because even though you can throw away the decaying fruit they are swarming on, the persistent insects continue to live in your home looking for other products to infest. They can also live inside the sewage drains, garbage cans, watered house plants and pet food bowls, making it all the more difficult to get rid of them. But there are some time-tested natural remedies that can help you keep your house free from gnats. These home recipes are not just easy to make and cheaper than retail pest control chemicals, they are also much safer to use with edible food, pets, plants and kids around.